I just finished making a winter doublespeed out of an old hi-ten Fuju Sport 12 frame and a bunch of parts I had lying around. The idea is to be able to go for rides in crummy winter weather without derailleurs or associated cables and levers to maintain. I haven't actually ridden it on the road yet, but it seems to work fine on rollers. It's my cheapest build ever, I think. The frame cost me $20 (but it came with a nice Ultra-sized Perfect freewheel that I squirrelled away and a pristine set of Dia Comp brakes). Other than that I think I only bought a set of brake cables at the LBS and a 25.8 seatpost (or was it a 25.6? I already forget) at the local bike coop for a few bucks. 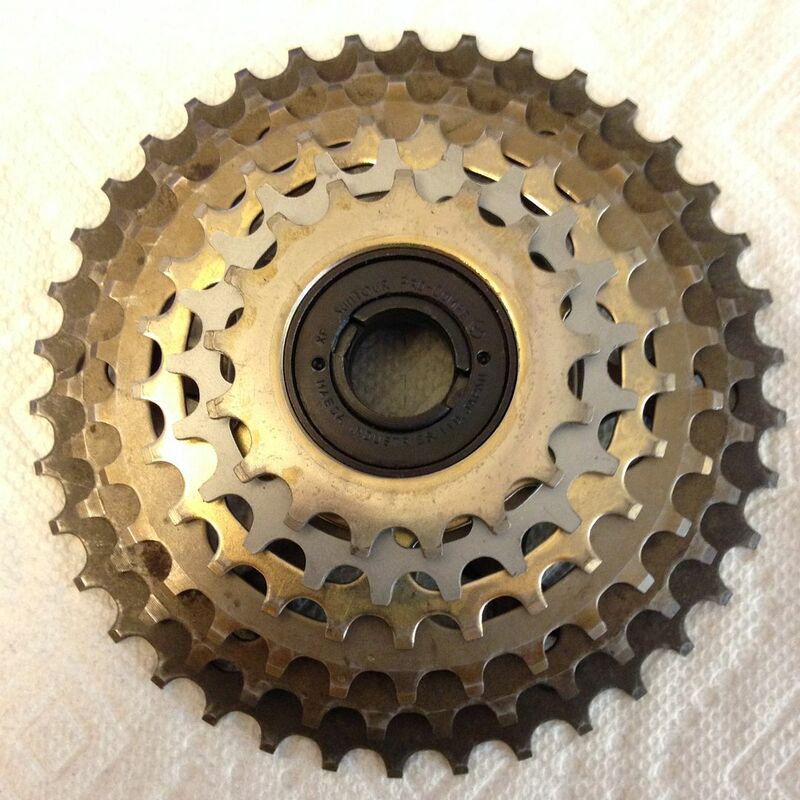 Anyway, the interesting thing, to me at least, was the two-speed freewheel I put together from a five-speed Suntour Perfect body, an 18-tooth threaded cog, a 26-tooth splined cog, three full-thickness spacers, and one half-thickness spacer. This is probably self-evident to many people, but the pictures show how it goes together: First the three full-thickness spacer on the bare freewheel body, then the splined cog--there should be just enough of the splined part of the freewheel body exposed to engage the splines on the cog--then the half-thickness spacer, then screw on the threaded cog to hold everything together. You could do something similar with a cassette wheel, of course, but I had a nice set of Shimano/Araya 5-speed wheels I wanted to use, and I have tons of five-speed Perfect bodies and cogs to go with them. By the way, I cherish a remark once made by Pastor Bob in politely declining my offer to send him some of my extra five-speed bodies. "No thank you," he said. "I'm flush with Perfect bodies." If the Freewheel Spa sold a T-shirt with that on the front I would buy one, cheap as I am. Wow, that's a big frame, isn't it? I'd been thinking it was a 25," but now that I look at it impartially it might just be a 26." That's an ugly stem, too, but I had it and the short reach helps compensate for the extra-long top tube. Anyway, the advantage to the five-speed wheel is that it's got less dish than a cassette wheel with wider spacing, so it's theoretically stronger as well as more classic and vintage-y. What I really like about this approach is that it locates both cogs pretty much in the center of the freewheel body, so it minimizes or eliminates the need to respace and redish the wheel. In my case, I got a perfect chainline using the spindle that originally came on the bike without changing anything. That setup gives me a 63-inch general use gear, which is actually a tad higher than I'd like, and a 35-inch low for getting up the big hills. I'll have to see how that works out in practice. "Progress might have been all right once, but it has gone on too long." Last edited by jonwvara; 12-09-14 at 02:22 PM. Neat! I believe the term used by mountain bikers is "dinglespeed." How quickly can you change gears? In a warm room it seems to take about 15 seconds. Out on the road, who knows? It's going to take longer by the slushy side of the road with mittened hands. I'm guessing at least a minute from coming to a stop to getting the bike rolling again. Rivendell did a similar setup a few years ago. I really wonder how a dinglespeed set up works in practice, especially off road. Your drive system is, of course, reminiscent of the stepped pulley system on my 1940s era Craftsman drill press. White Industries makes a two-cog freewheel, but I'll be it's a lot pricier than Jon's approach. Well, mine's cheaper than theirs. Given the price, I'm sure the White freewheel is a really well-made product. But the difference between tooth counts is so small that it hardly seems worth the trouble, at least to me. The benefit to the Perfect approach is that you can use a small cog of 14, 15, 16, 17, or 18 teeth--which is as big as the threaded cogs get, I think--and a big cog of anywhere from 16 to 34. Or even 38, if you can find one. That builds in lot of flexibility. It just means you can't claim yours to be very unique. That frame is big enough that you could braze on a second top tube for the full Rivvy effect. I just measured, and it's not as tall as I thought it might be. The seat tube is just a tad under 62 cm, center-to-center. The top tube is 60 cm ctc--a couple of cm longer than those on most of my other bikes. I'd call it moderately unique. I'm a modest guy. ...The benefit to the Perfect approach is that you can use a small cog of 14, 15, 16, 17, or 18 teeth--which is as big as the threaded cogs get, I think--and a big cog of anywhere from 16 to 34. Or even 38, if you can find one. That builds in lot of flexibility. 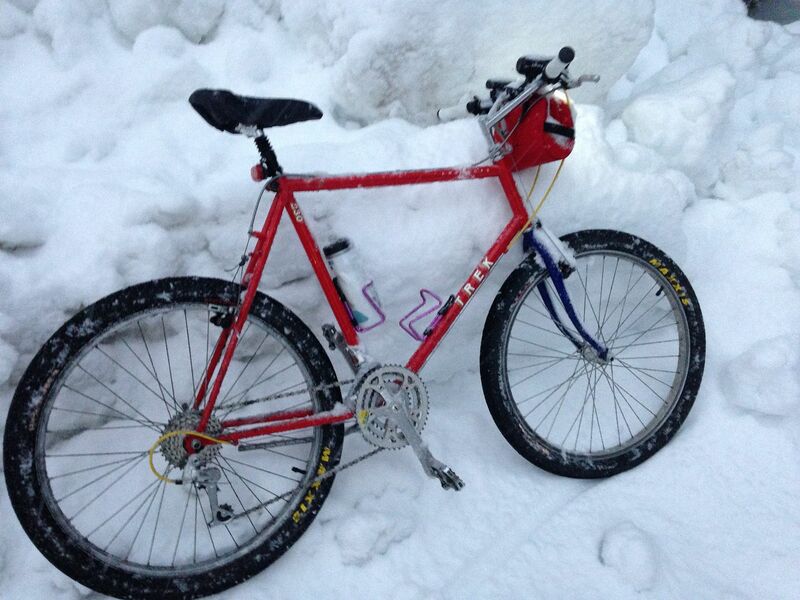 Jon, remember the Perfect I built for my race up Kearsarge Mt back in September? I discovered that the middle cog used on a New Winner freewheel also threads on to the Perfect body. These cogs come in 19, 20, 21, & 22 tooth count sizes, IIRC, which would allow you to go with a lower high gear if needed. Keep this in mind if you need to make adjustments after a few test rides. I'd smear a good layer of synthetic grease on the exposed threads in order to keep the rust from the road salt from attacking. Or better yet, drip candle wax all over it. Wrap it in hemp twine! Well, the freewheel will at least not feel any pain as it rusts away under the assault of salt. Whoa, great to know! It should have occurred to me that those threadings would be the same, but Perfects are pretty much all I ever fool around with. Pretty sure I have a couple of New Winners around here somewhere. If there's a 20-tooth cog among them, I may switch to a 20-26 in back and switch out the 42 in front for a 40 if I decide that the current high is too high. There's no good reason to go fast when riding in the winter around here and quite a few good reasons to go slowly. Jon, we should meet up for a salt-grinder ride. I could bring my UO-14 6 speed. (Sturmey-Archer hub w/2 cogs) Bob, you bring your eleventy-gear Cannondale. Not a bad idea. I went for a ride yesterday on this recent dump find. The 81 speed Cannondale is laid up for the winter for major PM and new fenders. @jonwvara, I'll see if I can find a spare New Winner 20T for you. And my (former) fifties era Troybilt rototiller. Pastor Bob, you are a great humanitarian. I plundered a New Winner for its 20-tooth threaded cog, and because I'm flush with Perfect bodies and 5-speed spacers, I built up an entirely new 20-28 freewheel. I'm reserving the 18-26 for use in warmer weather. The 20-28 gives me ratios of about 57 and 33, as compared to 63 and 35 for the 18-26. I think that's going to work a lot better in my terrain (and with my physique, such as it is) in the winter. Thanks again for the great advice. By the way, I was a little bit surprised to find that the same chain length works with both freewheels--I'd expected to have to add a link, and was running around and tearing my hair because I couldn't find the leftover length of the original chain. Last edited by jonwvara; 02-09-15 at 07:41 AM. @jonwvara this is internet colaboration at its best! 1987 or 88 Antelope 830 with Biopace? Nice dump find! Nice bars, too - were they on it? Is that a 24" wheel on the front? My research points to '86, but I could be wrong. Yes on the biopace, but the cranks came off another dump find. As did the bars and the wheels. I had to install a different fork to fit the 2.5" tires. Both wheels are 26 mtb size. Basically I found the frameset with rather natty bits, so they were all replaced with better dump found bits.